Case studies are gold. They are also underutilized in the T&I world. Case studies are real accounts of successful customer experiences. If written well, they could also convince new clients to hire you. When was the last time you read a customer review before you purchased something, or relied on an app on your mobile phone to see what others thought of a restaurant you were considering checking out? Your clients do the same. Testimonials are powerful -- no doubt about it. But case studies -- those are like testimonials on steroids. As translators and interpreters, we don’t often get to tell others about the work we do… at least not the finer details. Confidentiality clauses and codes of ethics make it difficult to showcase our work. But case studies can be a great solution in solving the issue of rarely getting to share our work with those who might hire us. Sure, we can send a potential client a sample. But a case study can show them what you can do for them. And that’s what most clients really want to know. If you’re not sure where to start when it comes to crafting the content for a few case studies for your website or LinkedIn profile, start small. Think of the times when a client complimented your work. What did they say? What did you do for them that caused them to send you those kind words? Make a mental note to follow up with this client and make a request to share their positive experience as a case study. Here’s an example of content that would be perfect to craft into two amazing case studies. Immediately after reading this tweet from my colleague, Jamie Hartz, I thought, “Those would make great case studies!” The outcomes Jamie shared in her tweet are the results clients are hoping to achieve when they hire a professional translator. This is the “why” behind the reason they hired her. They each had a goal to achieve, and because of Jamie’s great work, they achieved their desired outcomes. If you can’t think of a specific compliment from a client that could eventually be turned into a longer case study, create a folder in your email inbox or on your computer to start saving the compliments you receive. Once you receive one that showcases a really spectacular outcome for a client, you’ll have the content you need to write a solid case study worth sharing. If you’re not sure how to write a case study, start reading some from other industries and professionals who work with clients in a similar way as you (online, for most translators or in-person assignments, for interpreters). These examples can be truly helpful in helping you decide how you’d like to craft your own case studies. The overall message to share in your case studies is how you deliver value to your clients. So, look for this information in the case studies you read, and decide how you prefer to portray this information to your ideal clients. You don't have to break client confidentiality or share the actual content you translated or the assignment for which you interpreted. But you should ask your clients' permission if you want to feature them and their success (largely due to you, of course!) in a case study. Most clients are thrilled with this idea and will give you permission. However, if you are working for a corporate client or even a mid-size company, you may have to make sure you have other correct permissions — like that of the marketing or legal departments, for example. Don't let asking for these permissions stop you. Case studies are really powerful. So, if a client responds with a "No thanks," just move on to another client! Try to come up with one or two case studies a year if you can. Make them reflect the kind of work you want to keep doing for your clients, not work that you would rather avoid. And start small. 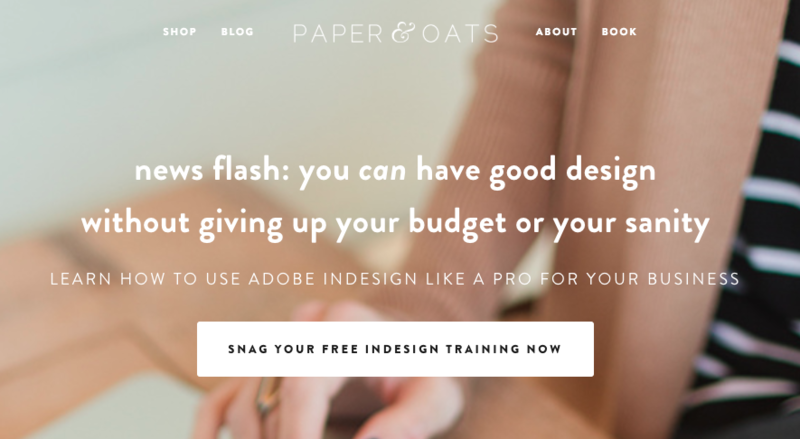 Your case studies don’t have to be pages long. In fact, a simple page on your website with testimonials and a few solid case studies is more than sufficient! If you want to get more mileage out of your case studies, you could even share them as a file on LinkedIn (just upload a PDF) or as an “article” that will remain pinned to the top of your profile. Have you ever thought about creating some case studies to showcase your work? Can a 10% Increase Change the Course of Your T&I Business? I was recently listening to an episode of The Rise Podcast in which Rachel Hollis was discussing the topic of a 10% increase in three areas of business, and I found it very intriguing. She said "Imagine what a 10% increase in your business could do for the growth of your business and your confidence in sales." and how they could potentially increase your revenue significantly over a few years. So, this got me thinking… what about for freelancers? Could a 10% increase in these areas be that significant? Let's unpack this a bit. For our purposes, let's hypothesize about a freelancer who is currently making about $60,000 a year with about 15 clients (both agency and direct clients), and each of the 15 clients sends this freelancer about 3 projects a month. Of course, these are all hypothetical numbers, but that comes to about 45 projects a month. These could be mostly small projects with a few large ones mixed in. A 10% increase in the number of this freelancer's customers means that she goes from having 15 clients to gaining only about 1 to 2 more (since we won't count .5 as a client). And a 10% increase in the average sale per customer, means that this freelancer should make at least $6,000 more the following year. But remember, she's gained 1 to 2 customers this year as part of her goal to increase the number of customers by 10%. A 10% increase in the frequency of her customer transactions, means that her workload goes from about 45 projects a month to about 49 or 50 projects a month. That sounds doable, if you ask me. It's not the same as adding 10 or 20 more projects a month, so if these are small projects and still bring in more revenue than before, then this is a positive change. While a 10% increase in each of these areas seems small, imagine doing this year after year. If the freelancer starts out making $60,000 the first year of trying to execute this strategy, she would ideally make $66,000 the next year, and then $72,600 the following year. This type of increase equates to more of a raise than a lot of people receive in a corporate job from one year to the next. To think about it another way, it's certainly more of a raise than most faculty members receive in academia. Imagine setting a goal to increase your freelance revenue by 10% each year in these three areas. How would you feel about these results? It definitely seems doable to add a few more clients, and to seek out those who can send a few more projects over the course of the year, right? Now, imagine if you also raised your translation or interpreting rate a little bit every couple of years or every few years. This number would definitely become higher over time. I continue to be intrigued by this notion. I think it's a tangible goal most of us can set for ourselves. I certainly would like to test it over a span of a few years. What about you? Are you willing to give it a try? To read more about increasing your T&I sales revenue, check out How to Project and Track Sales Revenue in Your T&I Business to Start Earning More. Have you ever heard of a lead magnet? I know… it does sound almost a bit "scammy" at first, but I promise it's not. At least, it shouldn't be. A lead magnet is a piece of content you create for your potential clients (or "leads") that is valuable to them and helps them to solve a problem or learn more about a certain topic. Some examples of lead magnets you might find from businesses online these days are digital workbooks, e-books, checklists, cheat sheets, guides, etc. In exchange for the document or file, you give your email address to the provider and join their email list. Lead magnets are usually given in exchange for one's information. This is why you will often see a Call to Action (CTA) with a lead magnet on a website. However, this is not the only way you can use a lead magnet. In fact, I'd argue that it's important to use them a bit differently than everyone else as yet another way to stand out to clients. I have created many lead magnets myself. Some gain more traction with clients than others, but it all depends on what your ideal audience wants to learn or know. Right now I'm in the process of developing a few lead magnets as a test in my marketing efforts this year. I'll keep you updated once I have a chance to use them and see how well they work. But the plan is to use this content as an attachment in a warm email to a potential client. If a lead magnet is something that sounds like it would be worth your time to create, and if you believe your potential clients might find one helpful, you will want to think about a few details so that you can plan to provide content that is both valuable and boosts your credibility. Here are some examples of a few lead magnets that are both attractive in nature and valuable to the customers they target. You'll see these are for various audiences, of course, but perhaps one of these will give you an idea of a lead magnet you could create for your own leads. Note: these are used on websites, but you can easily provide the same types of resources and send them out as attachments in an email to a potential client! So, how do you create a lead magnet? Well, first you have to understand your potential client's challenges. You'll want to create something that is valuable for more than one person so that you don't have to constantly create new content. You'll also want to make the content manageable to consume. Does your potential client base need a checklist that will be useful to them in their work? Would an e-book that is chock full of useful information for their field be valuable to them? Could a guide about something specific in their industry make them want to sign up for your email list or open your email attachment? All of these things can boost your credibility, and while these are just a few ideas, it is important to understand your audience first to know what will be most appealing to them. Whatever you choose to create, make sure that you make it fitting for your ideal clients. If your target market doesn't spend a lot of time in front of the computer at work, then you will want to make a lead magnet that is brief and to the point. If they (or you) are sensitive to design, then you will want to use a free tool like Canva or hire a graphic designer to make your lead magnet more attractive. You should also take into consideration the timing of your lead magnet. Make sure that the content you include is valuable at the time you release it. Is it appropriate for your client's particular situation, goals, challenges, etc. Would you need to release it at a certain time of year to be more relevant to them? You may have to test your lead magnet on a few potential clients to see how well it is received. You could also create two versions of your lead magnet and do a bit of A/B testing to see which version is received more positively and which one might need some extra work. Let me know if you make a lead magnet and how you use it. Not only is this a great way to show your expertise in a genuine way, but it is a valuable and useful piece of content for those who receive it. Or, that's the goal anyway! LinkedIn is a social network for professionals. It might be the one online platform where you wouldn't post a photo of yourself with your pet, but also a place where you hope you can be yourself as a professional and allow your personality to shine through. LinkedIn has changed a lot since its early days. Yes, you can still get people to "recommend" you (i.e., give you a testimonial), but LinkedIn is so much more powerful than that. Those testimonials or recommendations sit at the bottom of your profile. So, people have to scroll down to see them. That's not to say you shouldn't request and give recommendations. But these days, it's really important to understand the many features LinkedIn offers and how they can work for you. Yes, you'll have to do a bit of legwork, as your profile won't run itself. But trust me… it's worth it! For most of us, the referrals we get are how we obtain the majority of our business. At least, this seems to be the case for most freelancers and small business owners I talk to these days. Essentially, the more people you connect with on LinkedIn, the wider your network grows. This means that people will be able to find you even without referrals. This means that even though it once seemed impossible to connect with a higher-level executive dream client, it's now very possible that you know someone who is connected to them and can introduce you. It also means that the more active you are on LinkedIn, the more others will see you in their news feeds on the platform. The more people who are reminded about you, the more people who will remember to refer you the next time they hear of someone who needs your translation or interpreting services. Did you know that you can share original, penned articles on LinkedIn? Have you used this feature before? If you write a blog, or if you write even a short article just for LinkedIn itself, this is a fantastic way to show your expertise and knowledge in your area of specialization. Not only can you share this content on your profile, but you can link to it in LinkedIn forums as a response to a question someone asks. This type of interaction on any social platform positions you as an expert and a resource for others. Who wouldn't want to work with you if you're already so helpful and knowledgeable? (Bonus! The articles you write and share on LinkedIn stay at the top of your profile. When someone clicks on your profile, they will appear above the fold, i.e., before the point where they have to scroll down to see more of your profile. This means that you have a better chance of grabbing their attention right away and keeping them interested in learning more about you). These days you don't necessarily need to have access to someone's email inbox. If you can connect with them on LinkedIn, you have the opportunity to build a relationship with them. I'll give you an example. In my own freelance translation business, I serve clients in the areas of medicine and life sciences. I often translate documents like patient diaries and survey responses. I wanted to get in touch with a particular person who works at the Pew Research Center after reading an article he'd written about health disparities in the Latino population in the United States. I searched for a few minutes for an email address for him. I couldn't find one. But I did find him on LinkedIn, and I asked to make a connection. After a week, I saw that he'd accepted my invitation to connect, and we now have a dialogue open and our professional relationship can grow from there. If you do this well and you send a meaningful note when requesting a connection, most people will accept your request and will be interested in learning more about what you do. Even if they don't have work for you, they could serve as a referral or a client later on. The key is not to pitch your services in these types of requests. Relationship-building is the goal. This is related to number one above on some level, but think about it this way. The more often you interact on a social media platform, the more often others see you and what you're sharing. It's really that simple. If you are consistently providing valuable content, interacting in a meaningful way and encouraging others around you, then it will be pretty difficult for others to miss your content. The more you do this, the more others are "reminded" of you. And as far as I'm concerned, when someone's sharing positive and solid content, I'm happy to see their name and content in my news feed. What about you? By staying top of mind with consistent content sharing and interactions, you have a leg up on the next person who only jumps onto LinkedIn sporadically or to update their profile once a year. 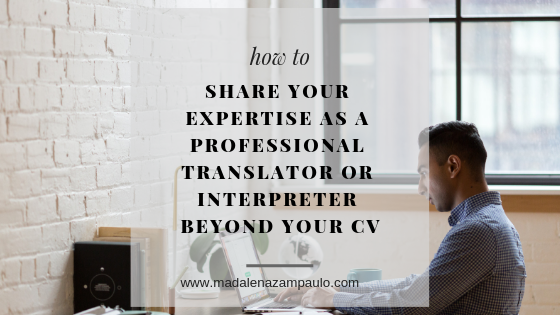 This means that you have more of a chance of being selected as the translation or interpreting provider for a new client, being referred to a new connection by a colleague and many more opportunities you wouldn't have if you just let your profile collect dust. I'll be the first to admit that LinkedIn is a platform that has held people's attention for longer than I had thought it would. Part of this is due to the fact that the platform is updated frequently, and professionals are seeking meaningful business relationships and opportunities online. I continue to use the free version of LinkedIn, and it works well for me. But I'd be interested if any readers have used the Premium option and found it helpful. Please share! For more strategies on how to use LinkedIn to grow your business, check out Seven Ways to Optimize Your LinkedIn Profile and Gain More Leads. There are lots of ways to share your expertise as a professional. And none of them have to do with what you list on your CV. After all, you don't introduce yourself to others online with the line, "Hi, my name is Paula. Here's my CV." That's why we need to think outside the box and use the reach of the world wide web to meet people where they are right now -- meaning, to talk to them in a way that makes sense with what they're seeking and the challenges they face -- and to show our expertise so that they can draw their own conclusions to hire us as translators and interpreters. Here are a few ways you can do this with just a little bit of added effort and a sense of what your clients are looking for when they decide it's time to call in a professional. Maintain a professional website that speaks directly to your translation or interpreting clients. Having an up-to-date website seems pretty obvious to most professionals these days. But boy… if I had a dime for every translator who told me they don't have time to work on or update their website, I might be able to retire early from my own translation business. All jokes aside, the "up-to-date" bit is just the beginning. Having a website that clearly appeals to your ideal clients first and foremost is key. You may also want to seriously think about writing a blog for your clients. A blog is a wonderful way to drive traffic to your website and to demonstrate your expertise on a given topic. Who better to write a blog for your ideal clients than you? If you know who they are and what their challenges are, you can talk to them -- by way of your web copy and visuals -- in a way that will help them draw the conclusion that you are the right fit for them. To read more about how your website is your best marketing tool, or how a blog can boost your online reach, check out Three Easy Ways to Drive More Traffic to Your T&I Website and Why Your Translation Business Needs a Blog. Or to learn how to transform your website into one that will speak to your clients, join the waitlist for my T&I Website Blueprint Course. Update your LinkedIn profile and connect with potential translation or interpreting clients. A lot of freelancers think of LinkedIn as a waste of time. The main thing I hear people saying is "I've never gotten any work from having a profile on LinkedIn." And my response is usually something along the lines of "When was the last time you logged in and updated your profile or tried to connect with someone?" Crickets. Just like any online platform, LinkedIn can be incredibly useful if you put in a little effort and time to make it work for you. Share information often -- both your own, as well as posts from others. Write articles to share as well (did you know that LinkedIn has this feature?). Or better yet… take the ones you've written for your professional blog and share them on LinkedIn as an article. Try to post to LinkedIn or share something valuable for your ideal clients at least once a day. Remember, it's nice to share information by and for colleagues, but remember, they're not usually the ones paying you to translate or interpret for them. Do your best to post content aimed at those you work for (or those who you'd like to be working for!) on a regular basis. For more information on how to use LinkedIn as a powerful marketing tool, check out How to Strategically Use LinkedIn to Grow Your Network and Business and How to Use LinkedIn as an Extension of Your Website. I often get asked by colleagues what kind of content our clients would find valuable. And while I cannot speak for anyone else's clients, I can say that it's not as hard to figure this out as we make it. Here's what I do. I think about my clients and who they are, what they struggle with, what their goals are, and where they hang out online. And then I think of how I can help them with their challenges, reaching their goals and how I can show up for them online. It's really that basic. From there, I decide how much content I want to share with them, how often and what type of content would provide value to them where they are right now in their business or organization. This could be an article I find online with a little note from me about something I think they'll find useful. It could be something I write myself because I cannot seem to find anything online that will be helpful in the way I think they would need at this time. Or it could even be a connection I make for them with a colleague or a professional in another industry who might be of service to them. I do it again and again. You can do the same on social media, sharing original blog posts or articles, as well as those from others. You can do it in direct emails to clients by writing something as simple as "Hi, Jane. I wrote this short piece on "X" and I think it might help you decide how you want to handle the upcoming "Y" you all are working on." Or you could even send someone a book you just read that you think will be truly valuable to them in their work. Include a short handwritten note with it. These things are unexpected and always appreciated. Yes, all of the items I mention here mean that you will have to go a bit above and beyond your normal work as a translator or interpreter. But in doing so, you have the ability to show others your expertise on a given topic or in a certain field. You'll also be able to show that you're keeping up with your specialization and that you dedicate time to doing so and to sharing that value with your clients. Above all else, it shows you care about what you do and about your clients. No matter what you share or the means by which you do so, remember that you are the face of your business. So, before you share something with someone, whether through your website, LinkedIn profile or elsewhere, make sure you ask yourself this very important question first... "How will this serve others?" If you're not sure, save the idea for later and move on with another one that you are sure will be valuable to the person receiving it. How do you show up for your clients or potential clients on a regular basis? What can you start doing today to show your clients the added value you bring to the business relationship?